There are many popular web services available online. From the rich set of APIs from Google and Yahoo to social sites likeTwitter and Facebook, almost all service providers make available their services in the form of an open API. These rich APIs has given rise to new kind of applications called mashups. They are basically an integration of various web APIs from different providers put together to form new kind of applications. In this and the next series of blogs, I will show how to integrate with some of these APIs. To make meaningful use of these APIs, let me propose a sample application where these services can be used. Let us develop a travel planning site that helps user to plan their travel dates and location. Travelling is just not about location and date. There are other factors like weather conditions, transport availabiity, political turmoil, other events clashing with date. Questions such as 'Are any of my friends travelling on that date or to that location? ', 'Do I know anyone from that location I am going to?' frequently comes up. Our site will try to resolve these questions so that a probable date and location can be zeroed on. 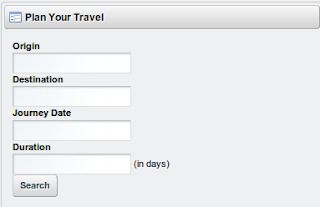 - Display input form for receiving the source, destination, journey date and duration. - Moving the marker on the Google map must also update all other information in real time like weather, events, news and the input form. For the first requirement, create a new portlet. 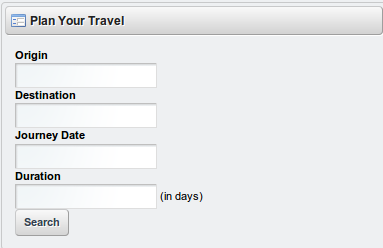 In the view.jsp file, design a basic form for the user to fill in: Origin, Destination, Journey Date and Duration. The code in bold above functions publishes the 4 parameters as an event using Liferay client side Inter Portlet Communication. For more details on IPC, see Portlet to Portlet Communication. This portlet also receives the 'directionsChanged' event from the Google Maps portlet. We will discuss this in the next blog. Developing fast loading pages is a complex task. Some have even defined it as an art. Large companies have dedicated professionals or hire external consultants to audit their applications for speed and responsiveness. Here I provide some simple tips to speed up page loading in Liferay. Liferay also provides some in built features for fast page loading. Whenever available, Liferay support will be shown for each tip. Sometimes, scripts are not immediately needed after page load but only after user takes some action. To prevent such scripts being loaded on page load, we can load in the background after the page has loaded. There are two ways for lazy loading. One, the script is added to the <head> tag and the other is to add it to the <body> tag. The function loadScript() above creates a dynamic script tag and adds it to the first head tag available. It registers this function to be called on load of the page. The function loadScript() above creates a dynamic script tag and adds it to the body. It registers this function to be called on load of the page. Liferay provides a minifier process that strips down both whitespaces and comments from script and css files. The minifier also shortens function and variable names to make the script even smaller. To enable the minifier, set the option in the portlet-ext.properties file. By default, both the options are true. Make sure, they are not false on production systems. If the browser can immediately determine the height and/or width of images and tables, it will be able to display a web page without having to reflow the content. This not only speeds the display of the page but prevents annoying changes in a page's layout when the page completes loading. For this reason, height and width should be specified for images and tables, whenever possible.